One of the funniest and most entertaining audio I’ve come across. 🙂 a must read/listen! I saw this one crop up on my lists so many times, Jeffery Kafer is one of the best narrators out there, and he usually nails it, but this kind of genre I wasn’t so sure on. So I never bothered. Until most recently, where I discovered CT Phipps works and had one of my other friends almost order me to buy these, and I’ve very glad I did. What I really loved about this book was not just the narration, man Jeffery do you blow this one out the water. Gary’s voice, his sense of weird humour and fun was just performed down to a T. I can’t stress how much you made me laugh out loud. I must have seemed like a crazy person. 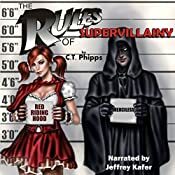 This whole plot was just a gas from start to finish, one of the funniest books I’ve ever listened to, and although I don’t really think of myself as a superhero or comic book fan, this just won me over to the dark side. Gary was such a great and dorkable idiot. He really, really wants to be a supervillain. And yet, everyone else thinks’s he’s not cut out for it, he seems to be doing more good than bad. Haha, Red is great, I love her character, spunky and also just on the verge of being so dopey it’s awesome. The story itself has some fantastic action, great twists to how things turn out, and the ending just leaves you wanting so much more. For anyone who wants something fun, entertaining and with some great character depth. This book is it! Highly recommended.